God's grace on my life is astounding. A Christian home, Godly parents, a strict but faithful upbringing. There was Music 24/7 in the house, singing with my siblings for all the church events. My youth was filled with band, choir, musicals, great formative teachers. College was the University of Southern California, with an undergraduate degree in Church Music! All the other students in the program were in graduate school. Singing was mainly what I did, but the compositional training I acquired there has been invaluable. Then I went on to Fuller Seminary, where I obtained an M. Div degree. Then God threw me one of those surprises. "No Walt, you're not going to be a pastor, I want you to sing for a while." And sure enough, a singing career opened up for me. Now it's almost 3 decades of session singing. I have sung on countless commercials, soundtracks, industrial shows, live engagements, you name it. I've sung with Roy Rogers, and chatted back stage with Robin Williams. I've been part of the Oscar orchestra as a singer numerous times. Even more wonderful was that the Lord allowed me to sing and produce and write for the Haven radio ministry for 24 years. That more than anything enabled me to begin writing for the church, and using my skills to bless the Lord's people in worship, and glorify the Lord as a result. I began leading worship at an Assemblies of God church in Costa Mesa in the early eighties, and have led band worship now for almost 20 years. 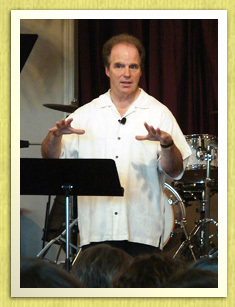 Currently, I lead 3 Sunday morning services at Grace Evangelical Free Church in La Mirada, and am the elder of worship. I have been happily married to the same wonderful woman for 36 years, my awesome wife Sherry. We have three grown children, with three little grandchildren from our oldest daughter Mindy. But with all of these things, the nicest thing God has done for me is to become my best friend. for who is he who will devote himself to be close to me?' declares the LORD. God has sought me out, given me a desire to know him, and has revealed himself to me again and again. I spend a daily time in scripture, and that more than anything has continually warmed my heart towards the Lord. I wouldn't change a thing about my life. God has set boundary lines for me, but they are very desirable and sweet boundaries.